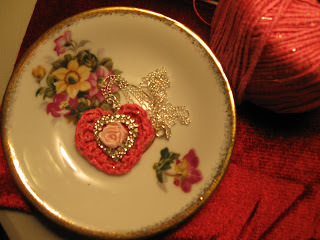 I am still crocheting little hearts! I finally visited a yarn shop here in my hometown this past Saturday. It is called the Whole Nine Yarns!! He he cute name huh? sparkles mixed in the yarn as well. I made the heart and thought what a lovely idea to incorporate it into jewelry! So I whipped out my silver necklace chaining and cut it to a length I would like to wear it, attached a silver rhinestone heart to it and in the middle added a ribbon rose I made eons ago.